William and Judy Schubert, shown here with their family, are long-time St. Joseph's supporters. William served on St. Joseph's Board of Directors and Judy is a member of the Barrow Women's Board. 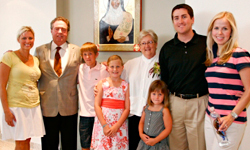 In 2007, the couple presented the hospital an icon of Mother Catherine McAuley, founder of the Sisters of Mercy. The icon hangs in the Debi and Jerry Bisgrove Admitting Lobby.